Alder is native throughout continental Europe, including Ireland. Its natural habitat is moist ground near rivers, ponds, and lakes. It thrives in marshes, wet woodland and streams, where its roots help prevent soil erosion. Alder is noted for its nitrogen fixing bacterium Frankia alni, found in the root nodules, which improves the fertility of soil wherever it grows. As a pioneer species, it can grow in nutrient poor soils while helping provide nitrogen for the successional species to follow. 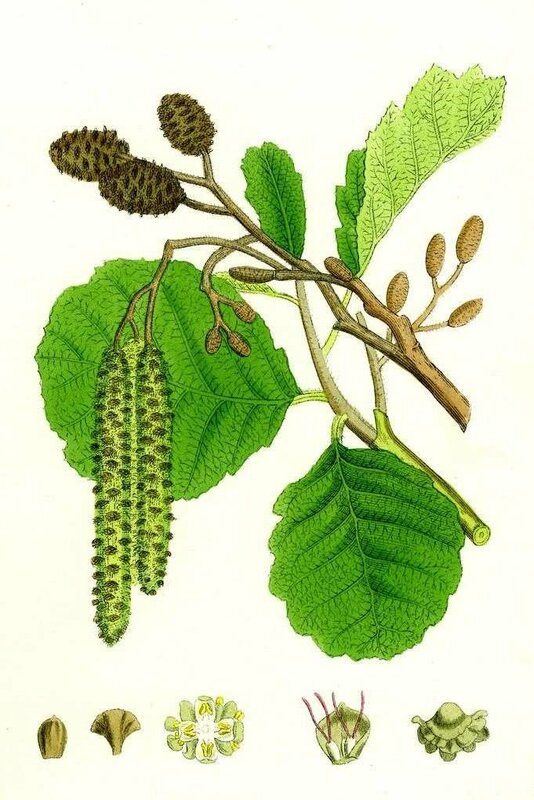 Alder is often used for rewilding industrial wastelands and brownfield sites. Conical in shape, mature trees can reach a height of 20m and live to around 50-60 years. The bark is dark and fissured and often covered in lichen. The leaves are dark green, racquet shaped, serrated and leathery to the touch. Look out for small brown cones that stay on the tree year round. Wet and swampy, alder woods, or carrs, were thought to have a mysterious atmosphere about them. When cut, the pale wood turns deep orange, giving the impression that it’s bleeding. As such many people in Ireland feared alder trees and thought it unlucky to pass one on a journey. The green dye from the flowers was used to colour and camouflage the clothes of outlaws like Robin Hood. Soft and porous, alder wood is only durable if kept wet, and its value to humans is down to its ability to withstand rot underwater. Historically, it has been used in the construction of boats, sluice gates and water pipes, and much of Venice is built on alder piles. More recently, alder trees are being used for flood mitigation.